This image was captured when I drove down a gravel road, to a home studio, to participate in a stained glass class. This "was" their backyard; they have since cleaned it up a bit and the cars are not sitting side-by-side. With the storage unit bringing up the rear - I found the vehicles fabulously textured to begin with. I have one photo that has a huge model car sitting on top of "stuff" inside between the front and back seats and makes a cool "window" shot. Love the old vehicles. Actually, I much prefer seeing a car graveyard like this over those places where they crunch them. Those always make me sad. This scene provided a beautiful picture. Hope the glass class worked out for you. I love old cars like these, they make such wonderful subjects with their rusting bodies and vintage shapes. Lovely old cars.....wish I could find a stash like that! Great shot and editing. OH, I like these old cars. Love the combination of rich color and rust and grunge. I love these old cars, and always stop for photos when I see them. really nice shot and processing! Have a great day! Oh, I would love to come upon a yard filled with cars like that. This is a wonderful shot Karen!! 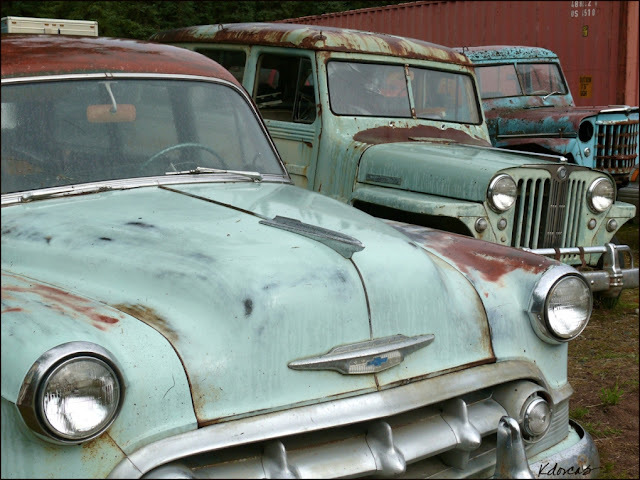 I adore these rusty cars, the grungy texture processing works so well with the colours of the cars. I really like it. It's such an iconic shot Karen! I LOVE the atmosphere created by old rusty cars - great job! I love this capture, and the processing. my favorite subject, old junk cars and/or trucks . . . just can never seem to find them! Great photo, great choice of texture. There's obviously a color theme going here! It's easy to see what a rainy climate does to vehicles. ;-) Great point of view! They make for a fantastic image...such lovely colors and texture all on their own! Nice work! I love the shades of red and blue in this photo! Wonderful image! Cool picture! - nice textures. The rusty vehicles are a GREAT find! Love them. Love the grungy treatment and the color. Beautiful shot. Love these old beauties! The one in the foreground looks like our first car! Great shot and processing is erfect for the subject. Very nice shot! Love old vehicles too! My husband would love those Willys wagons. And I always love vintage vehicles! It's perfect that all the colors are so similar. The texture goes perfectly with these "oldies"! I love these old vehicles! Beautiful photo! Love the vintage feeling and the angle! I love the natural texture of these vintage cars, and you've done a wonderful job enhancing it with Kim's texture. Altogether fabulous! Wonderful old cars and great texture work. Love old cars and trucks. I hope you had time to do lots and lots of shots. Great shot! As you said, great texture in the cars already, and I love your addition of Kim's texture. What a fantastic find! excellent composition and gorgeous patina and textures!